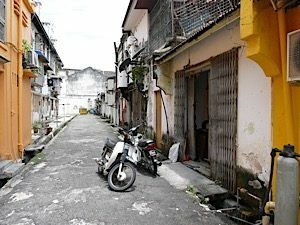 In a quiet lane in the back alleyways of Georgetown, I paused outside an open door, noticing the dark silhouette of a man standing in the corner of the concrete workshop. He was hunched over an upside down cane basket, gently swinging his arms in a circular motion. As I squinted and strained to see what he was making, he spun around and stared at me. My face instantly flushed and I froze on the spot !! The man cocked his head to one side and broke the tension with a smile. “What are you making?” I shyly enquire. ‘Putumayan’ He replies and invites me to come inside to watch. ‘Please remove your shoes’ he says. His face now beaming proudly as I enter into the small dimly lit room. 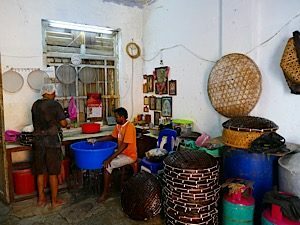 A small bench along one wall, a stack of broken baskets, a bucket of dough next to a plastic chair, a dusty shrine of hindu pictures hanging from the wall and a large gas steamer sat in the corner. For the next half an hour my new friend, Navi, continued the rhythmic motion making noodle swirls, as he shared his story. 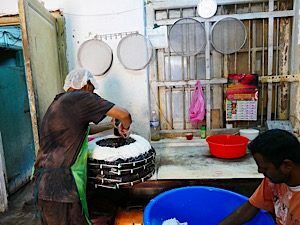 He was an accountant who gave up this career 13 years ago to take over the family business and learn the traditional craft of handmaking this delicious steamed noodle Street food from his grandfather. 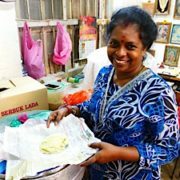 His helper plops a ball of dough into the old wooden paddle and Ravi continues to squeeze the noodles onto the basket. The process is strangely mesmerising, and before I know it, he has stacked up 3 basket loads whilst we have been talking. There is no time to stop, he has an order for 1000 pieces to be delivered before noon! I thank him for his time and as I turn to leave, he asks me to come back in 1.5 hours, after he has finished steaming the noodles and made his delivery. 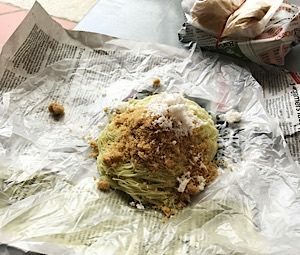 I gratefully accept his invitation, and when I return his wife, Sonar, who has returned from a successful morning of selling the Putu Mayan at the local markets, loads me up with a newspaper package filled with some of the freshly steamed noodles, and a generous topping of shredded coconut and brown sugar!! The taste is delicious!! Who knew a simple detour down a deserted alleyway would lead me to find new friends and an amazing tasty treasure! !